Takata’s Replacement Airbags Still Dangerous? The size and scope of the Takata recall remains unclear, even as officials announce that many of cars with defective Takata airbags that have been repaired, will need to be repaired again. Tuesdays congressional hearing, which began with lots of lawmaker criticism about the sloppy recall, marks an attempt by government officials to get answers about the airbag defect that is linked to at least six deaths and more than 100 injuries. 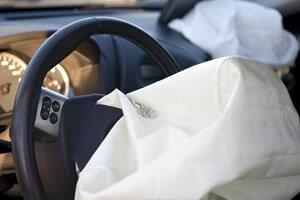 If you or someone you love has been injured by a defective Takata airbag, contact our committed personal injury attorneys in Tulsa for a free, no obligation consultation to review your claim. Takata says it is committed to replacing its current batwing style driver-side inflators. Officials say they know of 67 cases where airbags with this design ruptured. Mark Rosekind, head of the National Highway Traffic Safety Administration, testified that there are ten different configurations of the Takata airbag inflator, a critical reason that finding a root cause of the defect is difficult. Were talking about 34 million vehicles, the largest automobile recall in U.S. history. Due to the sheer size of the recall, auto industry officials and safety regulators say a replacement part may not be readily available. If this prompts consumers to ignore the recall, officials say we could be facing even more problems. Another point of contention during his testimony, Rosekind urged consumers to check their VIN numbers on a weekly basis at safercar.org. This isn’t the first time this request has been made. When the previous recall announcement was made last month, so many car owners flooded the government website to see if their vehicles were on the recalled list the site was temporarily knocked offline. During today’s congressional hearing, one of Takatas top executives is also expected to express his deep regrets for victims who were killed, or experienced injuries as a result of the faulty airbags. The accomplished Takata airbag recall attorneys(http://www.edwardslawok.com/takata-airbag-recall-lawyers.html) at The Edwards Law Firm are reviewing airbag claims against Takata Corp. and other manufacturers, and will be able to advise you of your rights after an injury.